I've been receiving Birchboxes for almost a year now and I keep going back and forth between being satisfied and wanting to try ipsy instead. Every time I think I'm going to give up on Birchbox they send me something I've been wanting to try, and this month was no exception! I'm not going to lie, the first review I read on a monthly Birchbox included a Chuao chocolatier (specifically the Maple Bacon Bar) and that was enough to convince me to give it a shot. I mean, it's bacon drizzled in maple syrup with a pinch of sea salt in milk chocolate...how can it not be good? Sorry, I got a bit off topic there! 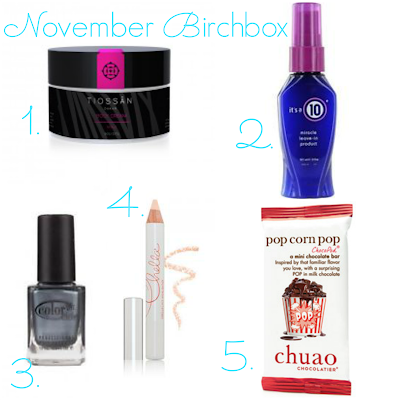 Here is my review of the November Birchbox and if you're interested in trying Birchbox for yourself click here! 1. Tiossan Body Cream - The scent on this body cream was really nice but definitely not subtle. It left my skin feeling silky and soft but not overly moisturized. Not bad for a sample but I couldn't see myself spending the money on it. 2. It's a 10 Miracle Leave-in Product - So far I've loved every It's a 10 product I've tried. It doesn't hurt that you can buy it at Target and I love anything I can get at Target. This makes your hair shiny and smooth but if you have fine hair like me it can weigh it down if you use too much so use sparingly unless you have thick hair. 3. Color Club Dark 'N Stormy - I immediately loved the color and was excited to have another gunmetal polish (I had one last year that met an untimely death with my tile floor however I now get to see it every morning on my carpet!) but I wasn't entirely satisfied with how long it lasted. I painted my nails two days ago and it's already chipping. I'll admit I don't have the best luck with my nail polish lasting though. 4. Chella Ivory Lace Highlighter Pencil - So far I've been happy with this product! It goes on easily and blends well. I love that unlike most highlighters it doesn't have any shimmer which allows it to be a more natural daytime highlighter. 5. Chuao Pop Corn Pop Bar - Sweet, salty, savory, and POP ROCKS! What's not to like? I'm a huge fan of sweet and salty so the sea salt in this chocolate was the perfect mix for me. It had a creamy, crunchy almost buttery taste that definitely made me feel like I was eating chocolate covered popcorn. The pop rocks at the end of the experience just topped the whole thing off. It gave you the sensation of popcorn popping in your mouth.